Colonel Jean-Francois Mercier, a military attache and French spy living in Poland, begins an affair with a lovely Polish lawyer named Anna while trying to obtain inside information on Germany’s planned invasion of France in Alan Furst’s atmospheric and meandering The Spies of Warsaw. Meticulously researched, Furst overloads the novel with historical details, and the dizzying onslaught of backwoods locales, small town visits, city districts, street names, aristocrats, military personnel and working-class spies makes it sometimes hard to keep track of where all the characters are and what they are doing. Furst spends just as much time on the private lives and social interactions of the spies who populate this novel as he does on their clandestine wheeling and dealing. There are many entertaining and atmospheric scenes that take place at swanky parties or night clubs where characters scope out their next lover while simultaneously seducing their next contact or target. 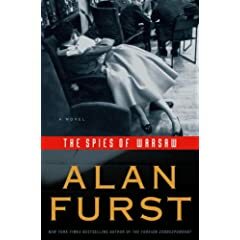 The Spies of Warsaw is the first novel I have read by Furst. I was drawn to him by the frequent comparisons to John Le Carre and Graham Greene (my favorite writer). Furst certainly scores in the atmosphere and details department. He puts the reader firmly and comfortably in place on the streets and in the bedrooms of Warsaw while capturing the malaise that covered much of Europe during the years leading up to World War II where many people carried on with their lives and affairs while knowing that “something” was about to happen and feeling there wasn’t much that could be done to stop it. However, Furst doesn’t deliver the character development or story arcs that Le Carre so often does. Furst’s writing also lacks the deep psychological and spiritual complexities that made Graham Greene’s spy novels so richly rewarding. Though peppered with intimate and exact details, Furst’s The Spies of Warsaw never gets deep inside the minds or hearts of the people he writes about. Though an entertaining read thanks in large part to Furst’s sometimes conversational and dryly humorous narrative voice, The Spies of Warsaw exists mostly at the surface level. The larger events surrounding the content of the novel were certainly building towards a world altering period of history, but Furst’s characters continue to meander and seem to go nowhere, while the plot builds to an anticlimactic finish. Fans of popular spy novels and historical fiction should be pleased, but those wanting something a bit more might be disappointed. This entry was posted in Book Reviews, Books, History, Literature and tagged Alan Furst, Espionage, Graham Greene, Historical Fiction, John Le Carre, Novels, Poland, Romance, Spies, Spy Novels, The Spies of Warsaw, Thrillers, Warsaw, World War Two. thanks for sending this out. Looks like this is my kind of book. I love all your reviews, where do you find the time?